The Cambrian Ross-Delamerian Orogeny records the first phase of accretional tectonics along the eastern margin of Gondwana following breakup of the supercontinent Rodinia. Western Tasmania represents a key area for understanding the Cambrian tectonic setting of the eastern margin of Gondwana as it is one of the few places where a Tethyan-type ophiolite is preserved and contains the only known exposures of a sub-ophiolitic metamorphic sole associated with the Ross-Delamerian Orogen. 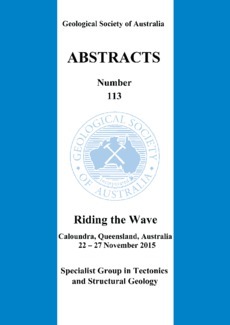 This paper presents an integrated study of the field, petrographic, geochemical, and metamorphic characteristics of the metamorphic sole to the western Tasmanian ophiolite. The structurally highest levels of the metamorphic sole consist of granulite−upper amphibolite facies metacumulates and metagabbros. A transition to amphibolite and epidote-amphibolite facies conditions is recorded by metadolerites and metabasalts towards the base of the metamorphic sole. Kinematic indicators in mylonitic amphibolites suggest the metamorphic sole formed in an east-dipping subduction zone located to the east of the Proterozoic continental crust of Tasmania. Major and trace element whole rock and relict igneous spinel geochemistry indicates that the protoliths to the metamorphic sole formed at a back arc basin spreading centre. Our new data supports a model in which east-dipping subduction in Tasmania was driven by collapse of a back arc basin developed above an earlier west-dipping subduction zone outboard of the eastern margin of Gondwana. The proposed model may help to resolve a controversy related to apparent along-strike variations in subduction zone polarity during the Ross-Delamerian Orogeny and suggests a complex geodynamic setting had developed along the eastern margin of Gondwana by the Middle Cambrian.